The Second Edition of this well-received book continues to offer the most concise, authoritative, and easy-to-follow introduction to the field of crystallography. Dedicated to providing a complete, basic presentation of the subject that does not assume a background in physics or math, the book's content flows logically from basic principles to methods, such as those for solving phase problems, interpretation of Patterson maps and the difference Fourier method, the fundamental theory of diffraction and the properties of crystals, and applications in determining macromolecular structure. This new edition includes a vast amount of carefully updated materials, as well as two completely new chapters on recording and compiling X-ray data and growing crystals of proteins and other macromolecules. 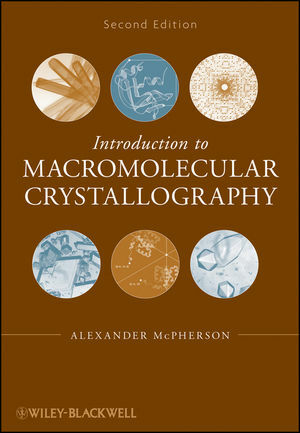 Richly illustrated throughout to clarify difficult concepts, this book takes a non-technical approach to crystallography that is ideal for professionals and graduate students in structural biology, biophysics, biochemistry, and molecular biology who are studying the subject for the first time. Alexander Mcpherson, PhD, is Professor in the Department of Molecular Biology and Biochemistry at the University of California, Irvine's School of Biological Sciences. The author of six books and 300 papers or reviews, he is widely considered the nation's foremost authority in the field of macromolecular crystallography. For over a decade, he has served as principal instructor of the Cold Spring Harbor Laboratory course inmacromolecular X-ray crystallography, an intensive course for which much of the material in this text was originally conceived. 1. AN OVERVIEW OF MAROMOLECUEAR CYRSTALLOGRAPHY. 3. THE NATURE OF CRYSTALS: SYSMMETRY AND THE UNIT CELL. 4. WAVES AND THEIR PROPERTIES. 5. DIFFRACTION FROM POINTS, PLANES, MOLECULES, AND CRYSTALS. 6. INTERPRETATIN OF DIFFRACTION PATTERNS. 8. SOLVING THE PHASE PROBLEM. 10. ELECTRON DENSITY, REFINEMENT, AND DIFFERENCE FOURIER MAPS. Thoroughly updated throughout with two wholly new chapters.